Snack + dessert – this cool treat just knocked both categories out of the park. 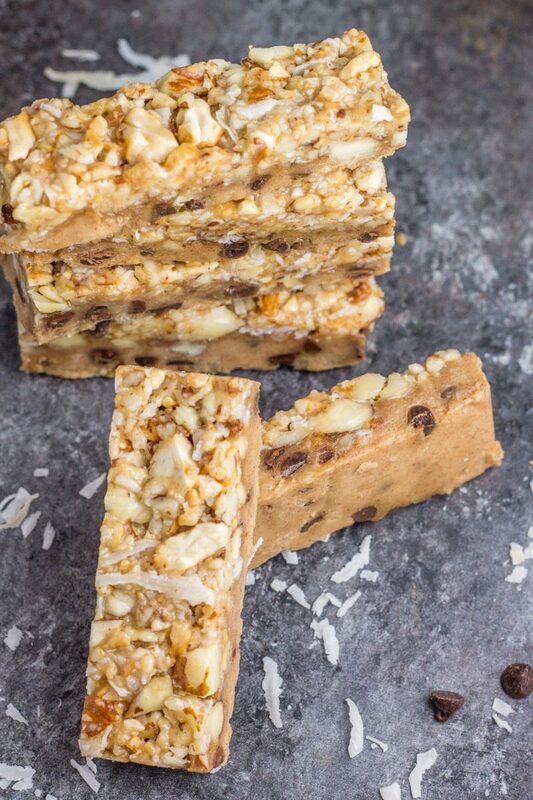 These healthy granola cookie dough bars are the perfect combo of crunchy and creamy, but sweetened naturally with all ‘good-for-you’, natural ingredients. 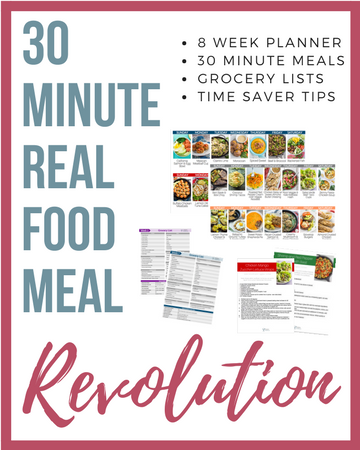 SO easy to make and even easier to eat. I can be kind of a nag. I can be kind of a control freak. Those two personality traits combined mean I’m pretty much the wife of my husband’s dreams (SARCASM). I can’t help it, I just can’t stop being in control of like, everything. I got a little taste of what he goes through when I posted a sneak peak of these healthy granola cookie dough bars on Instagram. You guys were like ALL over me from that point on. I love you all something fierce, but your persistence on Instagram is relentless. When you want a dessert recipe, nothing must stand in your way. I can’t truly blame you though – I’m the same way about how my underwear is folded, ALL dishes (clean or dirty) must be off the countertops, the pantry arranged in a specific order, and all the details of the week recorded on the fridge calendar. Things need be done in a timely and certain way. But dessert is a whole other beast. It’s important. I do understand, I do. Especially a dessert of epic portions like a honey granola top with almonds, cashews, and coconut. Especially a dessert with a healthy cookie dough base complete with mini chocolate chips. 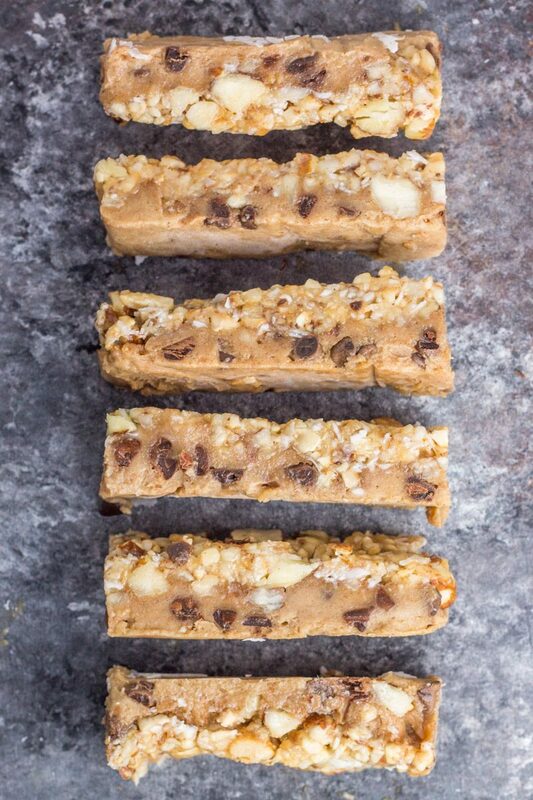 Especially these no bake healthy granola cookie dough bars. So here they are in all their glory. A decadent cookie dough base made of chickpeas and almond butter, topped with a simple honey granola nut mixture and frozen to perfect. Yep, these bars must be served cold. And they taste SO amazing as a cool summer treat – seriously favorite. Just make them. I’m certain you won’t regret it. Plus throwing a bunch of stuff in a food processor then layering is an epically easy way to make an epically delicious treat. I couldn’t not love these healthy granola cookie dough bars more if I tried. Feeling adventures? You can also flip these and the granola layer the bottom layer too! 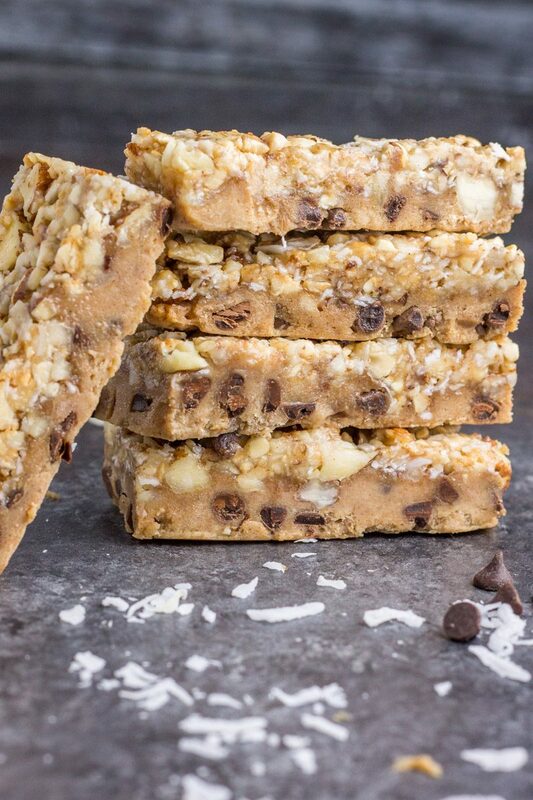 Nutty dessert bars kind of your gig? Then you also have to try these paleo key lime pie energy balls, no bake chocolate mango bars, and these flourless peanut butter & strawberry chia bars. 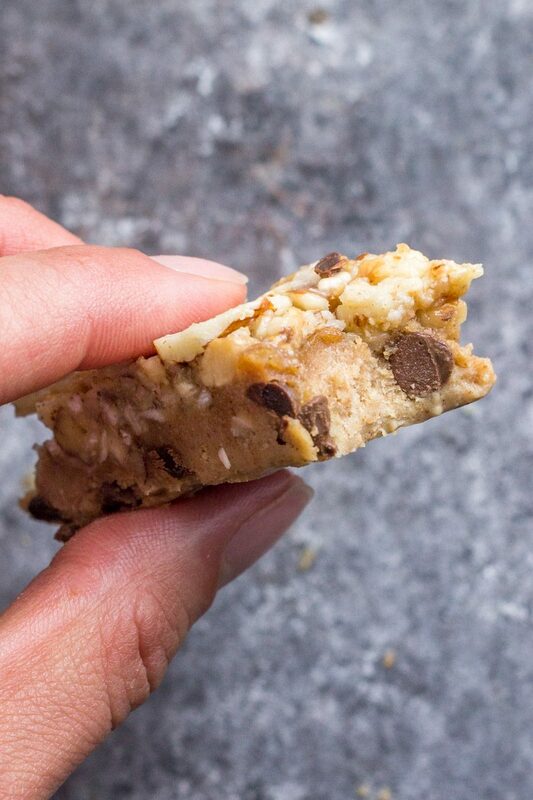 A crunchy cookie dough treat that’s actually good for you! 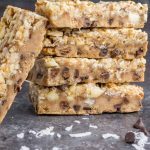 These healthy granola cookie dough bars and a cool treat with decadent flavor, but naturally sweetened and made with real food ingredients. Is there anything that can be used in place of the peas and beans? I am allergic to lentils and legumes, but really want to try this recipe! Thanks!! Can you use a different nut instead of cashew? I only have almonds and pecans on hand. These look absolutely amazing for my husband and i!! Trying to get him eating healthy without realizing it, he’s like a child. Due to my IBD though I can’t handle coconut, can I just skip that or sub it with something?? 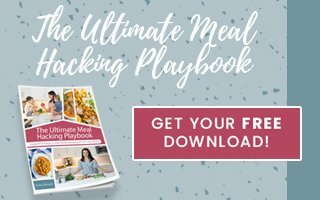 Thank you so much for all the work you put into your recipes, they are a lifesaver! You can totally omit the coconut Jordan! Chrissa, I can’t wait to make these! This will fit the bill for the cravings of me, and my daughters! Love the idea that they are cold, too! Love you on Instagram and your genuine posts. Blessings to your sweet family! Thanks so much for the sweet note Tanya! It’s hard to not eat it before it’s in bar form!! So glad you liked it Danielle! Could the be successful in a high power blender instead of a food processor? Yep, that should work too! My daughter made these and followed the recipe exactly, and they came out perfectly! Just sweet enough, and hearty and dense. Served them frozen/cold to my book group, and they devoured them. I’ll be making this recipe over and over. Thanks for your innovation! I am so intrigued by this recipe! I’ve heard of people using garbanzo beans in sweet recipes, but I’ve never seen a recipe that looks good enough for me to try. I’m constantly looking to eat healthier so I’m excited to try these. Thank you!! I made these today and they are really good. The only thing is they didnt stay together . Did i do something wrong ?i did use natural peanut butter. What is the nutrition value of this bar… caleries, sugars, carbs etc..
Would honey be used instead of maple syrup in the base? I don’t have any on hand and would prefer not to have to buy a whole bottle just for 3 T.
I would love to make these, but my daughter has a tree and peanut allergy. I could substitute a soy butter for the base, but do you think Sunflower and soynuts would work for the top? Can I use agave instead of honey?